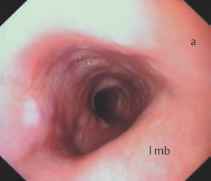 The middle esophageal constriction is reached at approximately 27 cm. 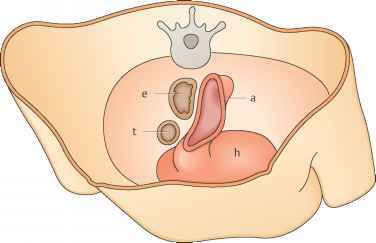 It is the first definite landmark that is seen in passing through the otherwise featureless cervical and upper thoracic esophagus. It is an asymmetrical luminal constriction caused by indentations from the aorta and left main bronchus (Table 2.3). 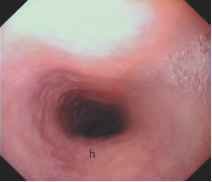 The aorta and bronchus are difficult to identify as such in the endoscopic image, and it can be difficult to appreciate their spatial relationships. 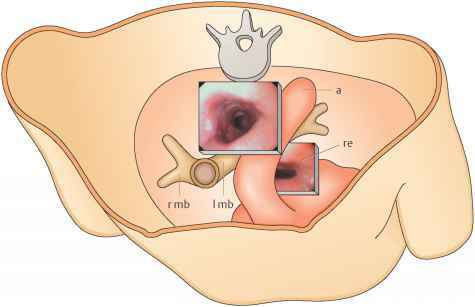 It is necessary to know the anatomy of this region and the orientation of the endoscope (Figs. 2.12, 2.13). 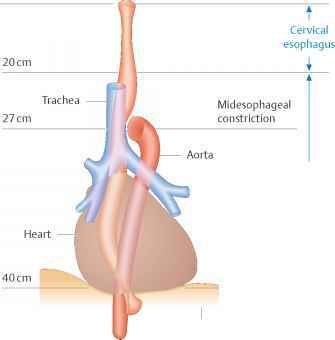 The aorta indents the esophagus from the lateral side and runs almost horizontally as it crosses the esophagus (Fig. 2.14a). 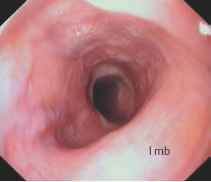 The left main bronchus indents the esophagus from the anterior side. 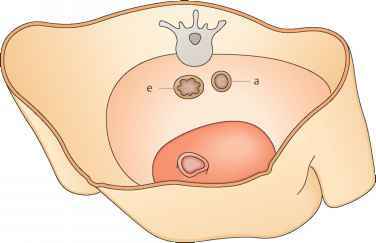 In the endoscopic image, it runs obliquely downward in a counterclockwise direction (Fig. 2.14b, c). It has a slightly ribbed surface. A posterior indentation from the spinal column is often seen opposite the bronchus. The aorta and bronchus cannot always be positively identified. 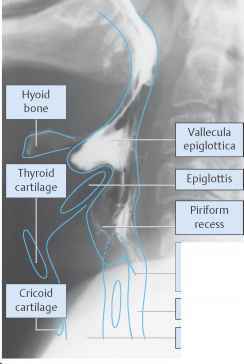 Bizarre shapes are sometimes noted in thin patients. The retrocardiac esophagus begins approximately 30-38 cm from the incisor teeth. It is curved posteriorly at this level due to displacement by the heart (Fig. 2.15; Table 2.4). 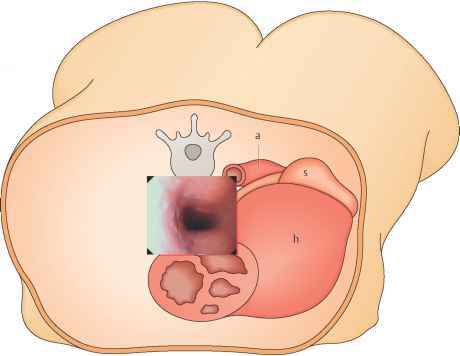 The retrocardiac esophagus is visualized just below the middle esophageal constriction. 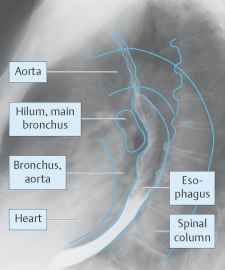 This portion of the esophagus is compressed anteriorly by the left atrium and posteriorly by the aorta for a length of 8 cm, resulting in an elliptical lumen (Figs. 2.16, 2.17). Distinct pulsations can be seen. Fig. 2.16a, b Retrocardiac esophagus.